The following is the Boxing Insider notebook for the week of January 2nd to January 9th, covering the comings and goings in the sport of boxing that you might have missed. Carl Frampton believes his clash against Nonito Donaire on Saturday, April 21 will be one of the biggest fights to ever take place in Belfast and a make-or-break bout for both men. MTK Global-backed two-weight world champion Frampton (24-1, 14KO) is set to take on Filipino four-weight world champion Donaire (38-4, 24KO) in a featherweight showdown at Belfast’s SSE Odyssey Arena. Both former Fighters of the Year, the pair will meet in a blockbuster bout, live on BT Sport and BoxNation in the UK and Ireland on a Frank Warren-promoted bill. Tickets ranging from £40 (tier) to £400 (inner-ring hospitality) will go on general sale this Thursday (January 11th) at 10am. And MTK Global’s Frampton is looking forward to meeting elite opposition on home soil in his first bout of 2018. With a much-anticipated summer fight date at Belfast’s Windsor Park in the works for ‘The Jackal’, 30-year-old Frampton believes a win over the 42-fight Filipino veteran would be perfect preparation ahead of a world-title tilt. The Irishman is coming off the back of a 10-round points win over Mexican Horacio Garcia last month in what was Frampton’s first outing since the loss of his WBA world featherweight crown to Leo Santa Cruz. And ‘The Jackal’ is confident that victory over Donaire will tee up a bout against the winner of the forthcoming IBF title clash between 126lb rivals Lee Selby and Josh Warrington. “In terms of the size of a fight, it’s not for a world title but the winner of this fight will no doubt get a world-title shot,” said Frampton. “On the world stage, I think this is a bigger fight than Lee Selby against Josh Warrington, which is a world-title fight, so it’s huge,” continued the Belfast native, whose reign as unified WBA & IBF world super-bantamweight champion in 2016 coincided with Donaire’s second spell as the WBO 122lb title holder before both men later claimed world featherweight belts. 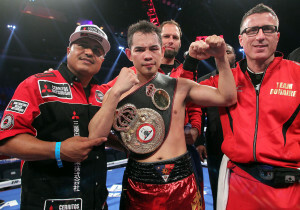 While Donaire has suffered three defeats since being named 2012 Fighter of the Year by The Ring, ESPN and the Boxing Writers’ Association of America –the same honours Frampton picked up for 2016 – the 35-year-old ‘Filipino Flash’ is eager to prove that he is still an elite force at 126lbs. MTK Global Professional Development Coordinator Jamie Conlan believes the fight will be an ideal warm-up for Frampton ahead of a summer world-title date. “Donaire is a great fighter and this will be a real test for Carl, but it’s one that MTK are confident he’ll pass and that he’ll do so in style. Fair play to Carl, he didn’t want a handy fight ahead of another world-title shot and we were keen to deliver that,” said Conlan. Step into the ring with HDNET MOVIES, as the network celebrates the life and legacy of boxing superstar Muhammad Ali on what would have been his 76TH Birthday with a “Remembering Ali” double feature—a night of documentaries and biopics starring the legend himself on Wednesday, Jan. 17, beginning at 7:15pE. The night kicks off with the star-studded 1977 biopic THE GREATEST, starring Ali as himself in his big screen debut. The film is based on his acclaimed autobiography of the same name, and recreates some of the most important moments of his life and career including his gold medal Olympic victory at 18 years old; his legendary match with Joe Frazier in the “Thrilla In Manila”; his conversion to Islam; and his three-and-a-half-year legal battle to win back the heavyweight title that was stripped from him when he refused to enter the army due to his religious beliefs. James Earl Jones, Robert Duvall, and Ben Johnson also star. Then, stay tuned for the classic 1970 documentary A.K.A. CASSIUS CLAY at 9pE, which provides an intimate glimpse into the boxing icon’s career with rare archived footage featuring Ali associates such as Malcolm X, Angelo Dundee, and more, as well as clips from some of his most famous fights including an epic bout with Sonny Liston. The piece is headlined by a very special sit-down with Ali and his longtime trainer Cus D’Amato, who discuss Ali’s career and share a priceless back-and-forth that true Ali aficionados won’t want to miss. Thomas “Cornflake” LaManna will headline the inaugural Boardwalk Boxing series when he takes the battle-tested veteran Gabriel Bracero in a ten-round welterweight bout for the WBC Fecarbox welterweight title on Saturday, February 24th at The Showboat Hotel in Atlantic City. The new Boardwalk Boxing series, which was announced last week, promised high-quality matchups, while featuring the best local fighters. LaManna, 26, of Millville, New Jersey has an impressive mark of 25-2 with nine knockouts. The popular LaManna has led the revival of boxing in Atlantic City as his Rising Star Promotions has become the preeminent promoter in Atlantic City. LaManna consistently has performed as a headliner in front of sell out crowds is eager to thrill fans, and potentially notch the biggest win of his career. LaManna will celebrate his 7th year as a professional, as he has wins over Kendal Mena (20-3), as well as winning the WBC Silver Latino and WBC FECARBOX Welterweight titles with a ten-round unanimous decision over rugged George Sosa. In his last bout, LaManna defended the WBC FECARBOX title with a ten-round unanimous decision over Samuel Amoako on November 28th in Atlantic City. This will be LaManna’s 18th fight in Atlantic City. Bracero of Brooklyn, New York has an impressive mark of 24-3 with five knockouts. Bracero, who will be 38 on February 14th has faced and defeated some impressive foes over his 17 year-career. Bracero win his first 18 bouts which were highlighted by wins over Winston Mathis (6-0), Danny O’Connor (14-0), Guillermo Valdes (12-3), Jermaine White (17-4), former world totle challenger Dmitry Salita (35-1-1), and a sensational 1st round stoppage over O’Connor (26-2) in the rematch. “This will be a good fight. He is a tough kid. He is tall, and I will get into the best shape possible,” said Bracero. “This fight is a true crossroads battle. He is looking to make his name off of me, and I am focusing on winning his WBC Fecarbox title. A win will get me back into the bigger fights. Also announced is a terrific co-feature bout that will see Anthony “Juice” Young of Atlantic City battling Khiary Gray or Worcester, Massachusetts. Young, 29, has a record of 18-2 with six knockouts. The seven-year professional will be looking for his eighth consecutive victory. The Atlantic City favorite has a quality win over Jose Javier Claderon (4-1), and will be making his 12th start in his hometown. Pitts has an impressive mark of 15-3 with eleven knockouts. The 25 year-old New Englander won his first 13 bouts. The four-year professional is a former UBF International Super Welterweight champion, and in his last bout he won the Interim New England Super Welterweight title with an eight-round majority decision over Greg Jackson on December 7, 2017 in Lincoln, Rhode Island. There will be an announcement about the full undercard shortly. Tickets are available for $155, $80 and $55, and can be purchased online at www.risingboxingpromotions.com . Damien Vazquez’ Sugar Promotions, will promote its card titled “New Blood”, featuring Issac “Canelito” Avelar (13-0, 8 KOs), vs. Alejandro Frias (6-2-1, 3 KOs), fighting for the WBC FECOMBOX Featherweight title in a 10-round main-event. The bout will take place at the Palenque de la Feria in Aguascalientes, Mexico on February 2, 2018. Issac “Canelito” Avelar, who is managed by Prince Ranch Boxing, is looking to make a statement in his hometown after having his last fight delayed due to a minor hand injury. “NEW BLOOD” also features undefeated bantamweight Damien “Sugar” Vazquez (12-0, 6 KOs) vs. TBA, unbeaten super-featherweight Edwing Davila (16-0, 9 KOs), vs. Octavio Guardado, Lightweight Donovan Estrella (10-0, 4 KOs) vs. Antonio Camacho, Mayran Reyes vs. Naomi Arellano, Christina Mora vs. TBA and light heavyweight Kye Brooks (1-0, 1 KO) vs. Ivan Sanchez. Damian Vasquez has his sights set on fighting McJoe Arroyo (17-2, 8 KOs) before the year is over.